BOXING GLOVES: GEL INFUSED & MULTI LAYERED V-IMPACT FOAM: Reduces the chance of injuring your fists. 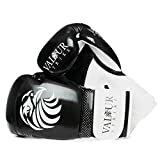 Valour Strike proudly present our Premium Polished Black Boxing Gloves. With a keen eye for detail these gloves have been designed to look good, feel good and perform even better. Sporting a new and exciting design the exterior to the glove is a thing of beauty that must be seen up close to appreciate. The V-Impact condensed and professionally placed shock absorbent foam protects the whole fist upon impact. Strategically placed 2.5cm wide support panel located just above the Velcro strap. The placement of the 2.5cm wide and 1.5cm depth strap lends support to the wrist area and base of the fist throughout impact. 4oz – The smallest glove we offer and specifically for small children. A great pair of 1st boxing gloves that will be remembered for a life time. 6oz – A child size boxing glove that can be used by kids for numerous exercises or disciplines. 8oz – Typically used by ladies for cardio workouts and training. Also used by large children. 10oz – A great choice for hitting pads and heavy bags. Generally not to used for sparring. the 10oz glove is perfect someone with smaller hands and females. 14oz– The most common ‘all rounder’ glove. They are slightly lighter than the large 16oz’s However, they can be used to spar without a problem. 16oz – Are the ‘gym standard’ sparring glove. If you’re a larger person with bigger hands. 16’s are pretty much the essential choice for any fighter doing live sparring.